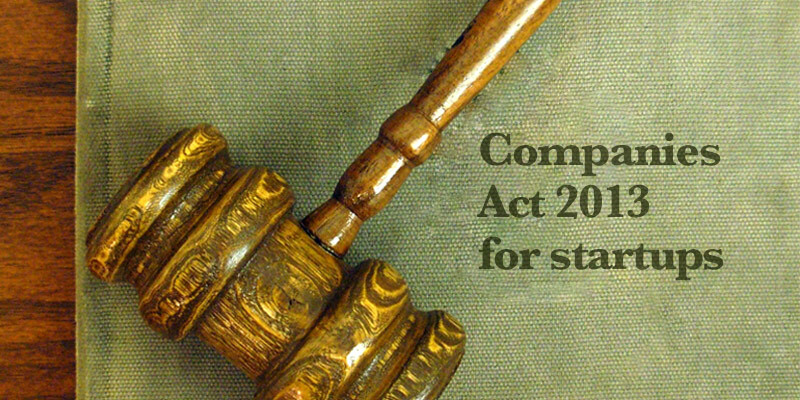 Some new concepts have been defined by the Companies Act 2013. If it is a profit based company, a profit loss account is required. If not, income and expenditure account of the financial year is needed. A small or a one person company may or may not include the cash flow statement in Companies Act 2013. (c) Who is not in relation with the directors or the promoters of the Company. The registration process has been made faster and compatible with e-governance. A declaration, in the prescribed form, required to be filed with the Registrar at the time of company registration that all the requirements of the Act in respect of registration and matters precedent or incidental thereto have been complied with, will be required to signed by both – a person named in the articles as a director, manager or secretary of the company as well as by an advocate, a chartered accountant, cost accountant or company secretary in practice, who is engaged in the formation of the company. A company shall, on and from the 15th day of its incorporation and at all times thereafter have a registered office capable of receiving and acknowledging all communications and notices as may be addressed to it. • Companies under Companies Act 2013 is required to furnish to the Registrar verification of its registered office within 30 days of company incorporation in the prescribed manner. • Where a company has changed its name(s) during the last two years, it shall paint or affix or print, along with its name, the former name or names so changed during the last two years. • Notice of change, verified in the manner prescribed, shall be given to the Registrar, within 15 days of the change, who shall record the same. • Paid-up capital is not less than Rs. five lakhs in the case of public company and one lakh in case of a private company. • the company has filed with the Registrar the verification of its registered office. Provided that in a case where a company does not secure the deposits or secures such deposits partially, then, the deposits shall be termed as ‘‘unsecured deposits’’ and shall be so quoted in every circular, form, advertisement or in any document related to invitation or acceptance of deposits. Companies Act 2013 requires the Company to register the particulars of EVERY CHARGE created by it on its property or assets or any of its undertaking including pledge. A director and the Company Secretary, or where there is no Company Secretary, by a Company Secretary in whole-time practice. It means that now in respect of all the companies under Companies Act 2013 (except one person companies and small companies), w appointed by the company, the Annual Return is compulsorily required to be signed by the Company Secretary in practice. in addition to the above, the annual return, filed by a listed company or by a company having such paid-up capital and turnover as may be prescribed, shall be certified by a company secretary in practice that the annual return discloses the facts correctly and adequately and that the Company has complied with all the provisions of the Act. It means, in the case of a listed company and other prescribed companies, even if the Annual Return is signed by the Company Secretary in employment, it is further required to be certified by the Company Secretary in Whole-time practice. In relation to a One Person Company and Small Company, the annual return is required to be signed by the Company Secretary, or where there is no Company Secretary, by one director of the company. Every listed company shall file a return in the prescribed form with the Registrar with respect to change in the number of shares held by promoters and top ten shareholders of such company, within fifteen days of such change. First AGM is required to be held within 9 months from the end of the first financial year. To encourage wider participation of shareholders at General Meetings, the Central Government may prescribe the class or classes of companies in which a member may exercise their vote at meetings by electronic means. One person companies have been given the option to dispense with the requirement of holding an AGM. Every listed company shall prepare a Report on each Annual General Meeting including confirmation to the effect that the meeting was convened, held and conducted as per the provisions of the Act and the Rules made there under. A copy of the report shall be filed with the Registrar within 30 days of the conclusion of the AGM. Every company having net worth of rupees five hundred crore or more, or turnover of rupees one thousand crore or more or a net profit of rupees five crore or more during any financial year shall constitute a Corporate Social Responsibility Committee of the Board consisting of three or more directors, out of which at least one director shall be an independent director. The Board’s report shall disclose the composition of the Corporate Social Responsibility Committee. Every company satisfying any of the above criteria has to mandatory spend 2% of the average net profits of the 3 immediately preceding financial years on Corporate Social Responsibility. Every company has to appoint, at the first Annual General Meeting, individual or a firm (firm shall include LLP) as an auditor who shall hold office till the conclusion of sixth Annual General Meeting and thereafter till the conclusion of every sixth AGM. Accordingly, the appointment of auditors is to be made for 5 years. The appointment is subject to the ratification of the members at every annual general meeting. All notices of, and other communications relating to, any general meeting shall be forwarded to the auditor of the company, and the auditor shall attend either by himself or through his authorized representative, who shall also be qualified to be an auditor, any general meeting and shall have right to be heard at such meeting on any part of the business which concerns him as the auditor. The previous approval of Central Government is no longer required for appointment of Cost Auditor as section 148 of the Act has dispensed with this requirement. Remuneration of the Cost Auditor also will be decided by the members. A person who is not a retiring director be eligible for appointment to the office of a director at any general meeting, if he, or some member intending to propose him as a director, has, not less than fourteen days before the meeting, left at the registered office of the company, a notice in writing under his hand signifying his candidature as a director or, as the case may be, the intention of such member to propose him as a candidate for that office, along with the deposit of one lakh rupees or such higher amount as may be prescribed which shall be refunded to such person or, as the case may be, to the member, if the person proposed gets elected as a director or gets more than twenty-five per cent. of total valid votes cast either on show of hands or on poll on such resolution. No person shall hold office as a director, including any alternate directorship, in more than twenty companies at the same time. Provided that the maximum number of public companies in which a person can be appointed as a director shall not exceed ten. The members of a company may, by special resolution, specify any lesser number of companies in which a director of the company may act as directors. Every whole-time key managerial personnel of a company shall be appointed by means of a resolution of the Board containing the terms and conditions of the appointment including the remuneration. If the office of any whole-time key managerial personnel is vacated, the resulting vacancy shall be filled-up by the Board at a meeting of the Board within a period of six months from the date of such vacancy. Every listed company and a company belonging to other class of companies under Companies Act 2013 as may be prescribed shall annexe with its Board’s report, a secretarial audit report, given by a company secretary in practice, in such form as may be prescribed. c. to discharge such other duties as may be prescribed. No compromise or arrangement shall be sanctioned by the Tribunal unless a certificate by the company’s auditor has been filed with the Tribunal to the effect that the accounting treatment, if any, proposed in the scheme of compromise or arrangement is in conformity with the accounting standards prescribed. Separate provisions have been provided for the merger or amalgamation between two small companies or between a holding company and a wholly owned subsidiary company. Provision for cross-border amalgamations between Indian Companies and companies incorporated in the jurisdictions of such countries as may be notified from time to time by the Central Government. Specific provision for purchase of minority shares in case an acquirer or person acting in concert with the acquirer become the holder of 90% or more of the issued capital of the company, either directly or by virtue of any amalgamation, share exchange, conversion of securities or any other reason. If the company acts against the constitutional norms, an integrity of the country and security of the state. If the tribunal believes that the company has been conducting its affairs in a fraudulent manner. An interim administrator is appointed by the tribunal from the panel of CAs and CSs maintained by the central government itself.